With only one week left in the school year (and only 4 more days to choose a gift), it’s ok to feel a bit panicked about finding the right gifts on time. No need to worry! We’ve done the research, reading posts from parents and teachers alike, and have put together these 7 tips for finding a great gift teachers will appreciate, and fast. 1. Avoid the “classics”, like mugs, ornaments, socks and candy – they’ve probably got too many already. 2. Give the gift of choice. Gift cards are a great way of thanking the teacher while letting them spend it the way they want. If you’re in Vancouver, Chapters and Pacific Centre mall make great gift cards. Otherwise, think coffee shop, mall, amazon or movie gift cards. 3. Flowers or plants can make a more personalized gift. 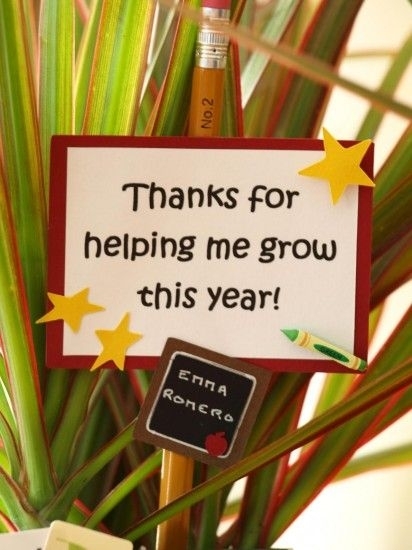 If the classroom has a couple of plants already, chances are the teacher would appreciate this gift. 4. Baked goods are a great idea if you have time and you know about the teacher’s food allergies. If you don’t, it’s best to steer clear of any homemade goodies. Check out these tasty and easy-to-do baking ideas. 5. Ask. If you have the chance to speak with the teacher this week, ask them what kind of things they like. 6. No need to spend money. Instead, go for a sincere thank you note. Include specific details about how the teacher helped your child, and get your child to sign it as well. If you have a picture of the teacher or the class on a field trip, include it in the card too. 7. Group gifts are best. Going in on a gift with other parents meanseveryone saves time and money, and with a bigger budget you have more gift options. Good luck finding a gift, and remember that it’s the thought that counts. It’s cheesy, but it’s true!